ASP.NET interview questions: - Creating a Unique Code in ASP.NET. This is one of the requirements that would come across you many a times while working on .NET projects. Some of the senior developers will find this question very easy but many of the developer friends find it difficult to answer the above question. So take a small example to see how exactly we can create a Unique Code like C001, C002......, C00n. Step1: - Create an ASP.NET Web Application for that just open Visual Studio >> go to >> File >> New >> Project >> Web >> Select ASP.NET Empty Web Application. Step2: - Now simply just add a Web Form in to your Web Application for that just go to Solution Explorer >> Right click on the Project name >> ADD >> New Item >> Select Web Form. Step3: - Assume that we have the table of Customer like below diagram. Step4: - Design your Web Form like below diagram. Also add a GridView Control to your WebForm.aspx page. Step5: - This is the most important step for creating Unique Customer code. 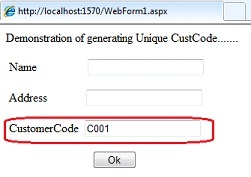 Add the below code snippet in to your WebForm.aspx.cs file. //the user to modify the Unique Code. Once you have done with all the above steps simply run the application and will see the result like below diagram. 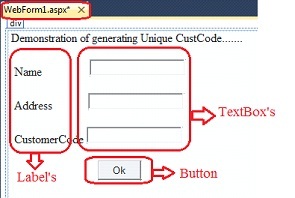 In the above code snippet you can clearly see that the Unique Customer Code is been generated. 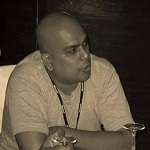 Get more from author's blog for ASP.NET interview questions.